History of Acquisition (Sequel) – This limited success ended with the rise of National Socialism and its delusions about racial purity. The collection was stored away in the basement of the Museum in 1936. Everything Jewish – be it Jewish as an acquired or ascribed identity – was stigmatized; what finally led to the known catastrophic consequences. The attitude of the Nazi administration towards the collection can`t be clearly interpreted from the sparse historic sources. Fact is that the collection survived. Some additional objects were acquired by the Museum from local Jewish families during the Nazi era. Since the circumstances of acquisition can`t be reconstructed en detail, those objects –representative furniture, some prayer books and house hold textiles – will be restituted to the descendants this year (2014). In the 1980-90s the public discussion about the Nazi past in Germany gained momentum. In this time a second peak of acquisitions of Jewish ceremonial objects can be discerned in the documents. Those objects were mostly without any relation to regional history and in most cases bought on the national and international art market. 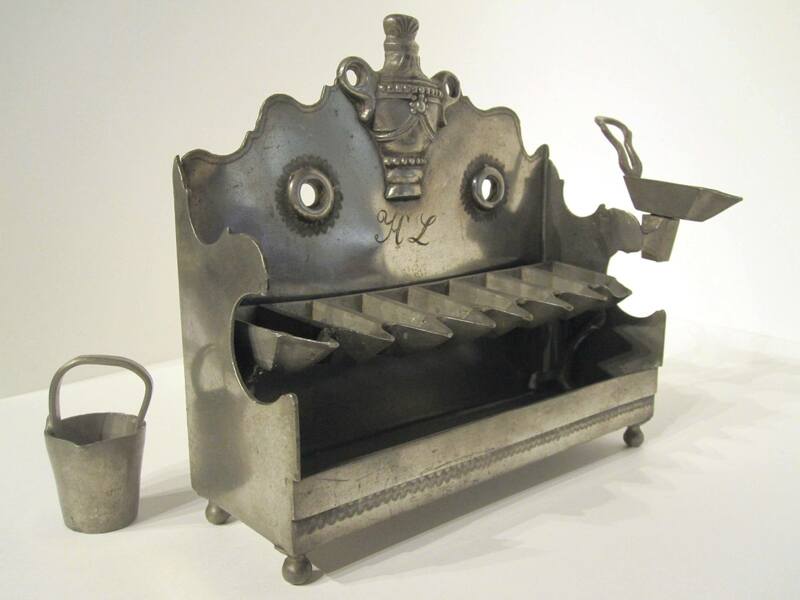 Was it an attempt to fill the gap that was left by the Holocaust with Jewish objects? To calm down an unease, to let objects answer questions that where not yet clearly shaped? Was it helplessness, the mere and thoughtless joy of collecting or the attempt to complete a collection of Jewish ceremonial objects? Hard to say today because the former museum administration left no documents concerning collecting policies. Some ritual objects like a yad, a chanukkiah and a candelabrum were given as items on loan to one of the two Jewish communities that were recreated in Göttingen in the 1990s. In turn the Jewish community (Angerstraße) sometimes gives or passes on items that were given to it to the museum. Glimpse into the Future – The present restoration of the Museum complex, the corresponding continuous movement of objects and current research paradigms like the process of creating knowledge and objects as a source of knowledge – all this poses a challenge and a chance at the same time for the Municipal Museum. The results of the ongoing research, including the Jewish ceremonial objects, will form the shape of the future up-to-date permanent exhibition. To secure one of the fundamental tasks of a museum – to preserve and to display objects – a part of the total collection of the Municipal Museum is undergoing a preservative treatment at the moment. This is the case for a part of the Museum`s collection of Jewish ceremonial objects, too. Objects consisting of organic material are being treated with nitrogen in order to prevent the potentially damaging effects of organisms like insects, microorganisms, etc. This entry was posted in Sammlung on 29. August 2014 by Städtisches Museum Göttingen. 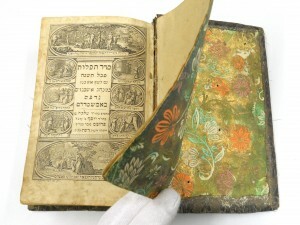 Objects – The collection comprises about 200 objects, mainly from synagogal and personal contexts of Jewish religious life. 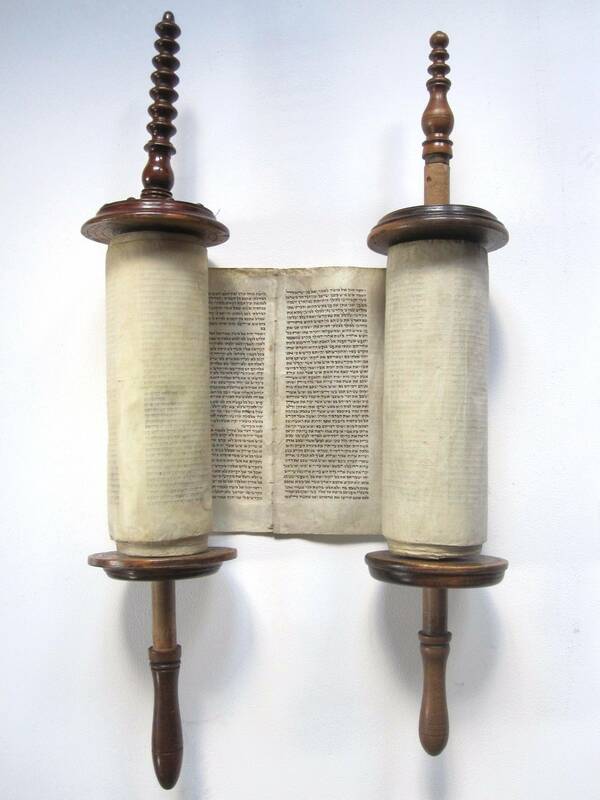 There are various examples of Torah curtains, Torah wrappers, Torah shields and finials, Hanukkah candelabra, Seder plates, Shabbath lamps, Kiddush cups, yads, etc. Some are of exceptional artistic value and were made of precious materials; others were produced in a more modest fashion. 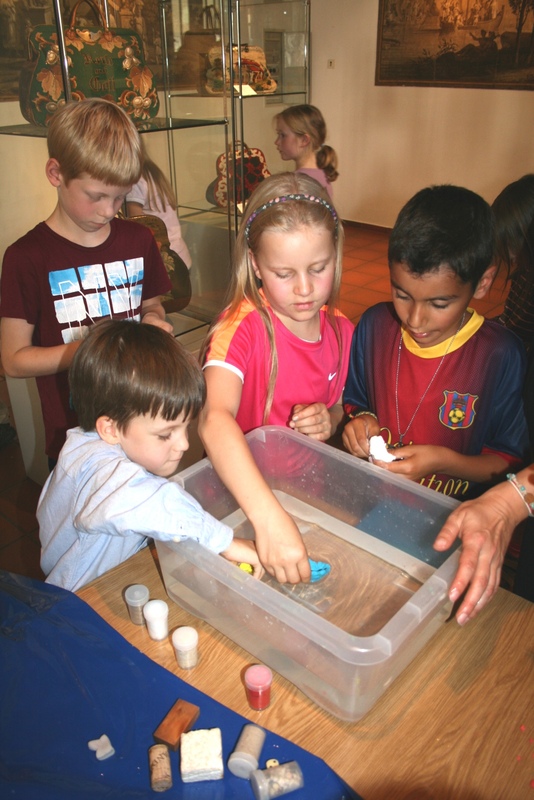 In any case all of them possess an immense cultural-historic value to the Museum, to science and to the public, not least because most of them originate from Göttingen and its surroundings. Many similar objects were lost due to the ravages of time and especially due to the lootings, melting downs (in case of objects made of precious metals) and destructions during the Nazi era and WW II. The earliest object in the Göttingen collection is a Shabbat lamp from the 15th century made of bronze. The most recent one is a certificate, issued by the Keren Hayesod in 1967 to the local Jewish community in appreciation of their donations to the State of Israel during the Six-Day War. 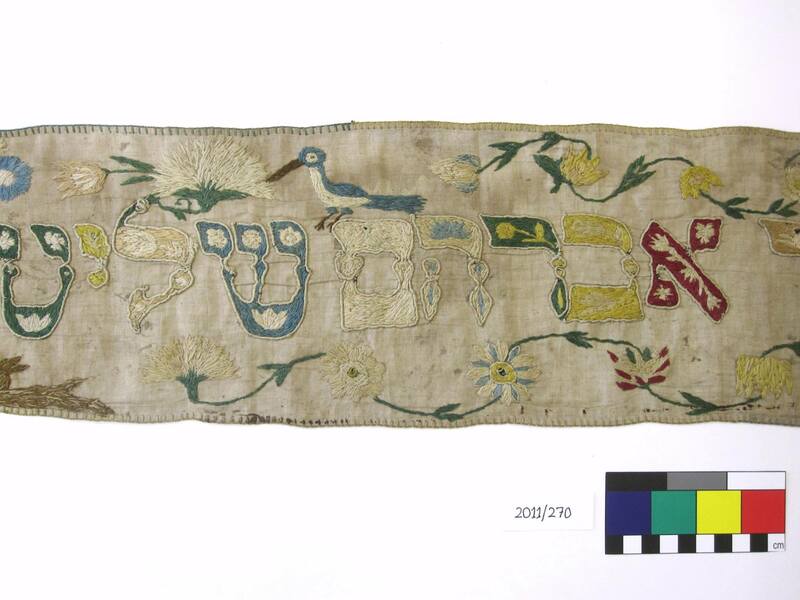 The Torah curtains and Torah wrappers are maybe the most evocative objects in the collection. The Torah curtains were made by highly specialized artisans. They used precious materials like e.g. elegantly colored silk and brocade that came from the bridal dress of the donor, adorned with Jewish symbols and dedicatory inscriptions stitched on the fabric with guilded or silver threads. 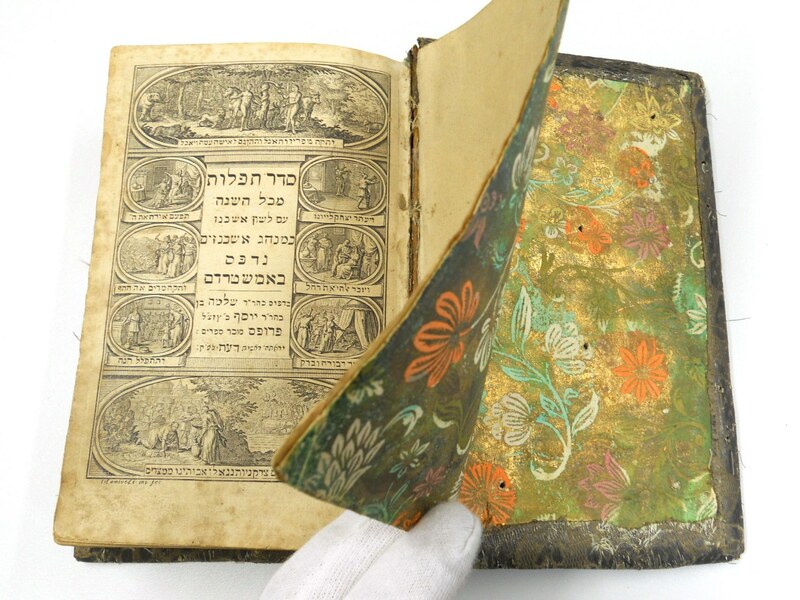 In contrast to the lavish curtains made by specialized artisans the Torah wrappers or wimpel from the collection are fine examples of Jewish folk art. 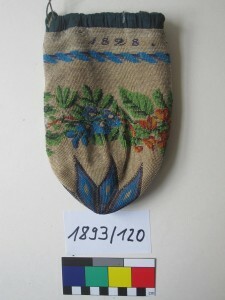 The oldest wimpel in the collection was made in 1646, one of the oldest surviving examples when compared to collections in New York, Jerusalem, Paris or Prague. 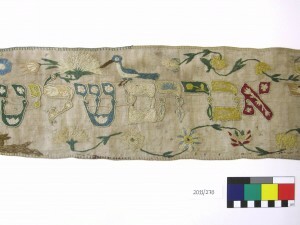 The vibrant colors of the painted or stitched Hebrew letters, symbolic animals, flowers and zodiac symbols on the sober and coarse linen are suggestive of the hardships and joys of the long vanished Jewish life in the villages. And in addition there are questions still to be shaped and answered. Who were the persons mentioned on the curtains and wrappers? How can the objects be interpreted in the context of the collection? How did the museum display the objects in the past and what messages do we want the objects to convey in the future? Questioning the objects, collection practices and the museum as institution itself means not only enriching Jewish cultural history. It can also be understood as a reconstruction of broader socio-cultural processes, identity building, knowledge production etc. The message for visitors could be: understanding the diversity of Jewish history and present means understanding culture and history in general. History of Acquisition – More than half of the number of Jewish ceremonial objects was acquired by the museum during its phase of establishment shortly before the 1900s. The Göttingen collection of Jewish ceremonial objects is quite old and large in comparison to other non-Jewish museums of medium sized German cities. On the one hand this is due to the participation of middle-class Jewish families in the cultural enterprises of the city. The names of numerous Jewish citizens can be found in the inventory catalogue as donors, brokers or sellers of Jewish ceremonial objects: Müller, Franck, Benfey, Gräfenberg, Hahn etc. Even three or maybe four individuals from the Gräfenberg family were involved: Carl Gräfenberg (born in Adelebsen, died 1907 in Göttingen), Carls wife Johanna née Schönheim (1846-1931) from Bleicherode in Thuringia, Salomon Gräfenberg (1834-1918) and a certain “Herr Gräfenberg” (the according notice in the inventory catalogue lacks further details). The other reason is a demographical and cultural change in the second half of the 19th century. Whereas in the past most Jews in German speaking countries lived in the countryside – the so called Landjuden –, deprived of civil rights, mostly poor and with limited access to a higher secular education, things changed with the foundation of the Kaiserreich. Many Jewish families moved to urban centers and made their careers. So the synagogues in the villages were disbanded, objects of a formerly pious and steady life changed their significance. Still in daily use for religious Jewish practice just a generation or two ago, later they were probably seen more like a family heirloom, apt to be given to a museum by donors who understood themselves in the first place as German citizens. 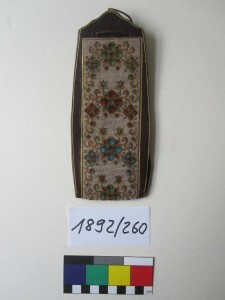 But the generous donations of Jewish ceremonial objects and the welcoming attitude of the Museum – from the outset there was a department for “Israelite antiquities” – was also a field for mutual construction of identities that successfully integrated (in this case) Jewish, local, national, secular and religious aspects. This entry was posted in Sammlung on 25. August 2014 by Städtisches Museum Göttingen. 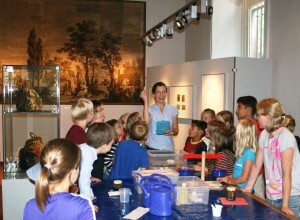 „Wenn es geregnet hat, wohin geht dann eigentlich das Wasser?“ fragt die Museumspädagogin Manuela Wengelnik die knapp 20 Kinder, die mit ihr und ihrer Kollegin Sandra Kästner am Boden im Tapetensaal des Museums sitzen. Lydia, die gleich neben ihr sitzt, weiß Bescheid: „Das Wasser versickert in der Erde, immer weiter und dann kommt eine Schicht Beton und da bleibt es stehen“. Grundsätzlich richtig. Den Feinheiten, was Wasser, Umwelt und den Menschen betrifft, spüren die Kinder an diesem Donnerstagnachmittag unter Anleitung der Museumspädagoginnen in Frage-und-Antwort-Runden und Experimenten nach. Grundsätzliches Wissen bringen die Kinder schon mit. Einer der Jungen weiß, dass jeder Mensch in Mitteleuropa täglich 180 Liter Wasser verbraucht. Und auch ihre eigenen Konzepte haben die Kinder entlang der etablierten Wissenschaft schon entwickelt. „Warum schwimmt denn das Öl hier im Glas oben auf dem Wasser?“, fragt Sandra Kästner. „Das Wasser ist unten und das Öl oben wegen der Leichtkraft“, antwortet ein Mädchen. Das ist eigentlich nur logisch: wenn es eine Schwerkraft gibt, muss es auch eine Leichtkraft geben. Es ging in den Gesprächen nicht nur ums Heute und geografische sowie kulturelle Unterschiede in Bezug auf Wasser, sondern auch um die Vergangenheit. Wie sah eigentlich Körperpflege und Hygiene vor 70 oder 80 Jahren aus? Was hatte es mit dem samstäglichen Badetag auf sich und wer durfte zuerst in den Badezuber? Bei den anschließenden Experimenten rund ums Wasser waren die Kinder wieder ganz im Hier und Jetzt. Experimente, die z.B. die die Wirkung von Seife veranschaulichen. Oder Oberflächenspannung, Verdrängung , Schwimmfähigkeit und einiges mehr. Schließlich stand noch eine kleine Zeitreise auf dem Plan. „Wer kennt denn so ein Teil hier?“. Manuela Wengelnik hält ein altes Waschbrett in die Runde. Fragende Gesichter. Nach den Ausführungen der Museumspädagoginnen zum Alltag des Wäschewaschens im Prä-Waschmaschinen-Zeitalter ging es ans Ausprobieren draußen auf dem Museumshof. Einige der Jungen waren schon groß genug, um zu meinen, dass diese Arbeit ja so leicht sei, dass das eben nur Frauen machen konnten. Beim anschließenden Ausprobieren auf dem Waschbrett wurde ihre Wäsche aber eher dreckiger als sauberer, wie jemand aus der Runde amüsiert feststellte. Nach dem Auswringen wurde eine Wäscheleine zwischen den Bäumen gespannt und die Wäsche mit alten Holzklammern aufgehängt. Wieder zurück im Haus ging es an das letzte Gimmick, die Zeit war fast um. „Was, so schnell sind zwei Stunden? !“, stellte Cem bedauernd fest. Er konnte dann aber noch eine aus Papier ausgeschnittene Blume ins Wasser legen. Die dann wie von Zauberhand langsam aufging. Die Veranstaltung wurde unterstützt durch den Museumsverbund Südniedersachen e.V. 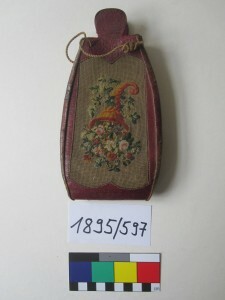 This entry was posted in Präsentationen & Veranstaltungen on 15. August 2014 by Städtisches Museum Göttingen. Auf der Suche nach einem geeigneten Ausgleich zu meinem Dissertationsprojekt über die Anfänge der Tabakrezeption in Norddeutschland gewährte mir das Städtische Museum Göttingen einen vierwöchigen Einblick in die vielseitige, von der Kuratorin als „Kern der Museumsarbeit“ bezeichnete Beschäftigung mit musealen Objekten. Gleich am ersten Tag fand ich mich inmitten eines bunt gemischten Teams aus festangestellten und ehrenamtlichen Mitarbeitern wieder, deren Engagement und Akribie bei der Dokumentation von musealen Gegenständen mich beeindruckten, und die sich nicht selten als wahre Spezialisten erwiesen. So nahm sich beispielsweise die leidenschaftliche Handtaschensammlerin, die sich über viele Jahre umfassende Kenntnisse über Textilien angeeignet hatte, liebevoll der Kategorisierung der Bestände des Textilmagazins an, berichtete der Numismatiker begeistert von den umfangreichen Münzschätzen des Museums, mit deren Inventarisierung er betraut war, oder präsentierte der eifrige Kinderbuchsammler, der sich der Einordnung literarischer Stücke widmete, stolz die neu entdeckten handschriftlichen Eintragungen in einem alten Göttinger Lyrikband. Auch der wissenschaftliche Volontär, der sich im Rahmen seiner Dissertation mit der Identitätsfindung der Juden auf Mallorca auseinandergesetzt hatte, ließ sein Fachwissen in seine Museumstätigkeit einfließen und übernahm die Erfassung der Göttinger Judaica. Beflügelt von dieser geballten Expertise, die mich an meinem Arbeitsplatz umgab, hoffte auch ich einen qualitativen Beitrag leisten und mein kulturhistorisches Wissen über den Tabak einbringen zu können. Abgesehen von unterstützenden Tätigkeiten, wie dem Korrekturlesen von Museumsartikeln und Erläuterungstexten oder der Mithilfe beim Fotografieren von Textilien, kümmerte ich mich folglich um die Bestandsaufnahme der Tabakobjekte: Die Metadaten zu Pfeifenköpfen, Tabakbeuteln, Feuerzeugen, Streichholzschachteln oder Aschenbechern fanden nach teils anregenden und fruchtbaren Debatten über entsprechende Informationsdetails ihren Eingang in die Datenbanken des museumsinternen Inventarisierungsprogramms. Über die Mitarbeit in einem aufgeschlossenen, lebenslustigen und kompetenten Kollegium sowie über den respektvollen Umgang mit geschichtsträchtigen Gegenständen hatte sich mir schließlich am Ende der vier Wochen der „Kern der Museumsarbeit“ erschlossen, und dafür bin ich dankbar. This entry was posted in Mitarbeiterberichte on 5. August 2014 by Städtisches Museum Göttingen.